1. Could I see reading this book again? 2. Would I want to read this book with my kids? 3. Would I want my children reading this book? 4. Could I see myself sharing this book with other parents and educators? 5. Is the story good enough to entertain children and adults who read to or with them? This book gets a resounding yes to all 5 questions. 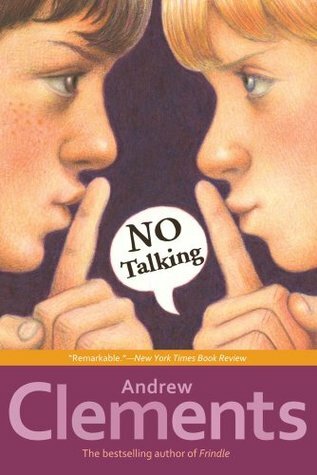 In this book Dave and Lynsey end up in a battle, they are leading the 5th grade boys and girls in a challenge to speak the fewest words. The rules are: ""You can say only three words in a row. And only if a teacher or a grown-up talks to you first. Except you can talk to a kid first. Because you're sort of a teacher. And no talking at all outside of school-honor system." The challenge was set for 2 days, and almost immediately the teachers notice something is up. Some teachers figure out what is going on, there is resistance from some teachers and from the principal Mrs. Hiatt. It was also interesting watching how the children found ways to communicate without the words. I found that this book really made me think about the words I use, how I use them. How often do I speak when I should stay silent? Do I remain silent when I should be speaking up? Reading this book has had an impact on me at work, with my friends and at home. As such it was an absolute excellent read. And I really cannot wait to read this with my children. Almost every chapter has a wonderful sketch by Mark Elliott. They contribute to the story. I know my children, especially the younger one's love the pictures even as we push them more and more towards chapters books. This was another excellent read. I cannot recommend this and the other books I have read by Andrew Clements enough. Give it a try and see if it is not great!